The Michigan Wall Map Executive Commercial Edition is available paper, laminated or framed in multiple sizes from 2×3 to 4×6 feet. State of Minnesota regional 5 digit zip code wall maps to include Minneapolis, St. Paul, Mankato and more. 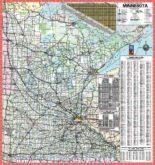 The Minnesota Wall Map Executive Commercial Edition is available paper, laminated or framed in multiple sizes from 2×3 to 4×6 feet. State of Mississippi regional zip code wall maps to include the cities of Jackson, Gulfport, Biloxi, Tupelo and more. The Mississippi Wall Map Executive Commercial Edition is available paper, laminated or framed in multiple sizes from 2×3 to 4×6 feet. State of Missouri regional 5 digit zip code wall maps to include St. Louis, Kansas City, Independence, Springfield and more. Highly detailed wall map of Mobile, Alabama to include roads, cities, waterways, geography and points of interest. 54" x 64"
Official DOT large city, county and highway wall map of Montana State available paper, laminated or framed in multiple sizes from 2×3 to 4×6 feet. Starting at $24.95. State of Nebraska regional 5 digit zip code wall maps to include Lincoln, Omaha and more. Official DOT large city, county and highway wall map of Nebraska State available paper, laminated or framed in multiple sizes from 2×3 to 4×6 feet. Starting at $24.95. Official DOT large city, county and highway wall map of Nevada State available paper, laminated or framed in multiple sizes from 2×3 to 4×6 feet. Starting at $24.95. State of New Jersey regional 5 digit zip code wall maps to include Newark, Jersey City, North Bergen, Union City, Cherry Hill, Toms River, Atlantic City and more. The New Jersey Wall Map Executive Commercial Edition is available paper, laminated or framed in multiple sizes from 2×3 to 4×6 feet. Official DOT large city, county and highway wall map of New Mexico State available paper, laminated or framed in multiple sizes from 2×3 to 4×6 feet. Starting at $24.95. Highly detailed wall map to include all roads, cities, waterways, all geography. 45" x 64" to include Orleans Parish with downtown and Slidell. State of New York regional 5 digit zip code wall maps to include New York City, Long Island, Albany, Utica, Buffalo, Rochester, Syracuse, Manhatten with Nassau and Suffolk Counties and much more. State of North Carolina regional 5 digit zip code wall maps to include Charlotte, Winston Salem, Greensboro, Durham, Raleigh, Fayetteville, Wilmington and more. The North Carolina Wall Map Executive Commercial Edition is available paper, laminated or framed in multiple sizes from 2×3 to 4×6 feet. The North Dakota Wall Map Executive Commercial Edition is available paper, laminated or framed in multiple sizes from 2×3 to 4×6 feet. Northcentral USA Executive Wall Map Laminated is a must-have reference tool for business. Now available in many sizes and finished to meet your office needs. The Northeastern United States Executive City County Wall Map is available in paper, laminated or framed in a variety of sizes. A must-have reference tool for any business! Northwestern United States Executive City County Wall Map is available in a variety of sizes to meet any business/marketing needs. Available paper, laminated or framed. State of Ohio regional 5 digit zip code wall maps to include Dayton, Columbus, Akron, Toledo, Cleveland, Cincinnati and more. Official DOT large city, county and highway wall map of Ohio State available paper, laminated or framed in multiple sizes from 2×3 to 4×6 feet. Starting at $24.95. State of Oklahoma regional 5 digit zip code wall maps to include the cities of Tulsa, Oklahoma City and more. State of Oregon regional 5 digit zip code wall maps to include Portland, Eugene, Salem, Hillsboro, Medford and more. The Oregon Wall Map Executive Commercial Edition is available paper, laminated or framed in multiple sizes from 2×3 to 4×6 feet. State of Pennsylvania regional 5 digit zip code wall maps to include Philadelphia, Pittsburgh, Reading, Allentown, Lancaster, Erie, Scranton and more. The Pennsylvania Wall Map Executive Commercial Edition is available paper, laminated or framed in multiple sizes from 2×3 to 4×6 feet. Official DOT large city, county and highway wall map of Rhode Island State available paper, laminated or framed in multiple sizes from 2×3 to 4×6 feet. Starting at $24.95. The RMC Classic Edition World Wall Map 32×50 poster is available Laminated, Peel n’ Stick, Railed or Framed. Enjoy the accuracy and detail of RMC Series of World and USA Wall Maps. State of South Carolina regional 5 digit zip code wall maps to include Greenville, Columbia, Charleston, Spartanburg and more. The South Carolina Wall Map Executive Commercial Edition is available paper, laminated or framed in multiple sizes from 2×3 to 4×6 feet. the South Dakota Wall Map Executive Commercial Edition is available paper, laminated or framed in multiple sizes from 2×3 to 4×6 feet. Southcentral United States Executive City County Wall Map is a must have reference map for any business. Available paper, laminated or framed. Highly detailed wall map to include roads, cities, waterways, geography and points of interest. 46" x 64" to include Detroit and its regional area. Southeastern United States Executive City-County Wall Map is available in a variety of sizes and finishes from 36×48 to 60×96. A great marketing tool available in paper, laminated, wood railed or framed. Southwest United States Executive City County Wall Map is a must-have reference tool for business. Now available in many sizes and finished to meet your business and marketing needs. Highly detailed wall map to include roads, cities, waterways, geography and points of interest. 54" x 77" to include the city of Slidell.